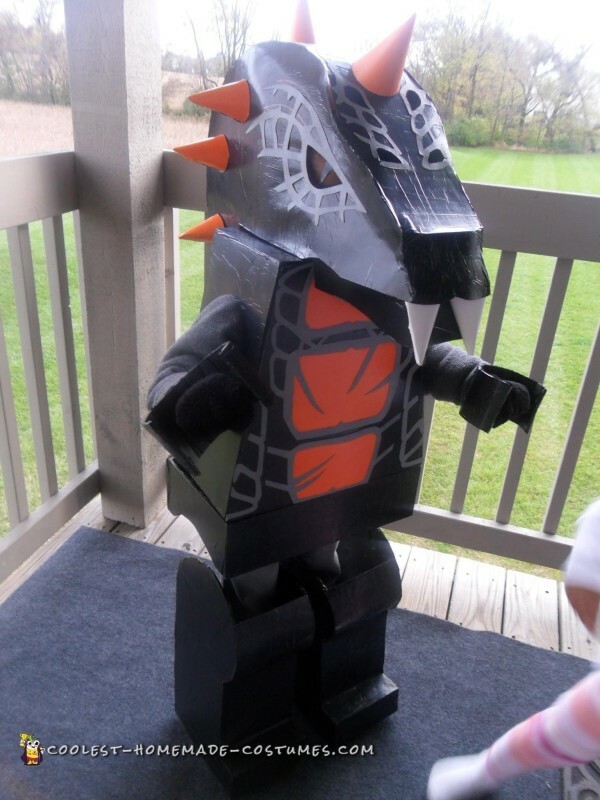 DIY Bytar Ninjago Lego Costume - Not Found in Stores! There are essentially 4 sections to the costume: Leg coverings, torso, hand coverings and helmet. Most of the supplies were purchased at Dollar Tree so it cost around $10 to make. Everything was sketched free-hand using a Lego mini-fig as inspiration. Once the main pieces were cut from foam core, they were hot glued together and then reinforced with duct tape – on the inside so seams don’t show! Poster board was used for the curved portions of the legs and hat because they were easier to bend. Spray adhesive allowed us to cover the Lego costume with trash bags making it look more like plastic and ensuring it was rainproof. Silver poster board was cut with an X-Acto knife for the scale detailing & mounted with spray adhesive. Party hats were painted orange & hot glued to the hat; two more were painted white for the fangs. The bottom of the hat is completely open so it’s easier to look down while walking. We also cut out Bytar’s eyes and made multiple holes in the scale area for added visibility. The hat sits on top of the torso. The torso slides over the head, cuffs have holes to slide hands through and feet slide into leg boots (with a strap to hold them in place). Lastly, we printed Lego Ninjago logos from the internet and glued them to a bag – all ready to collect lots of candy! 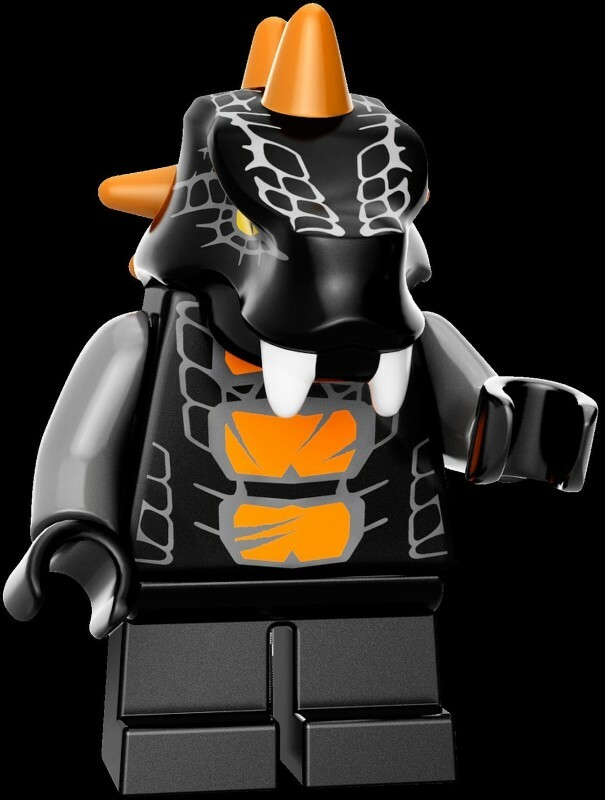 He won two contests with this Bytar Ninjago Lego costume. 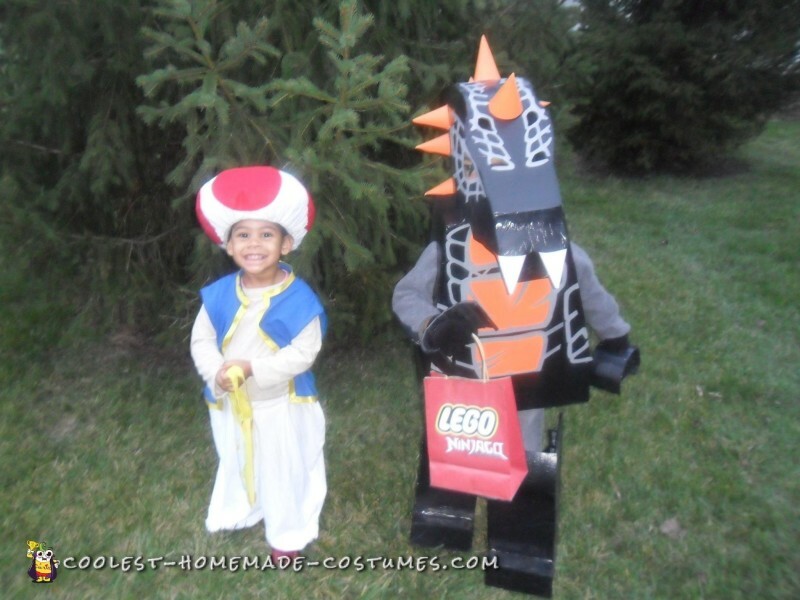 Oh, and that’s his little sis as Mario Toad; we couldn’t talk her into being Princess Peach!